Home / Germany / #Berlin March 3, 2018: Together against the Turkish attacks on #Afrin! #Berlin March 3, 2018: Together against the Turkish attacks on #Afrin! Call of the “Alliance for Peace and Democracy in Afrin” at full length. Originally published by Alliance for Peace and Democracy in Afrin. Translated by ANF News. You will find the German version here. 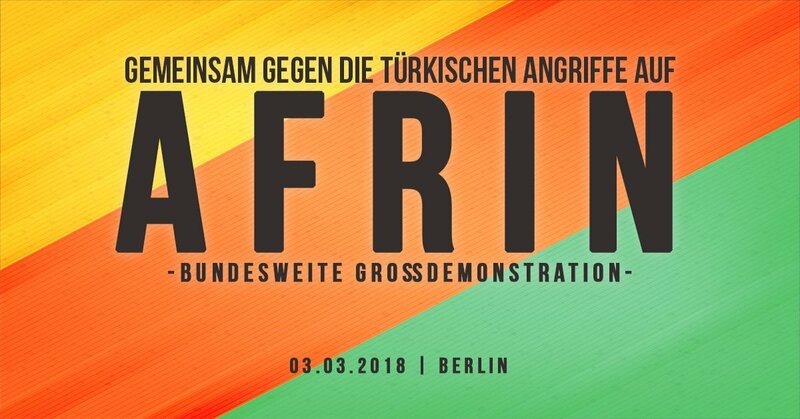 Berlin March 3, 2018: Together against the Turkish attacks on Afrin! Since January 20, 2018, the Turkish military is attacking the Afrin area in Rojava, northern Syria, along with Salafist or jihadist groups. Kurds of Muslim, Alevi and Ezidi faith make up the majority of Afrin’s population. In addition, it is home to Christian Assyrians and Syrian Arabs as well as occasionally Armenians. The city of Afrin with its surrounding villages in northwestern Syria has been able to maintain relative stability and peace since the beginning of the war, despite repeated attacks by the Nusra Front, the Islamic State (IS) or other Islamist groups, and the Turkish military. Even more, from 2015, Afrin has been safe haven for hundreds of thousands of internally displaced people from Aleppo and the surrounding areas despite embargo and isolation. The Turkish army and allied Salafists or jihadists under the label of the Free Syrian Army (FSA) not only target refugees, but also cause new displacements currently. The attacks by the Turkish military from the ground and from the air have so far [as of 6 February 2018] killed 148 civilians, including 17 children. The number of wounded is currently 365. A large proportion of these civilian casualties are Syrian internally displaced persons. Civilian residential areas are bombarded with artillery and bombed from the air, entire villages are razed to the ground and infrastructure is systematically destroyed, such as water treatment plants. Video footage documents war crimes such as torturing of YPJ fighter Barin Kobane’s dead body and the torture and ill-treatment of captured Kurdish people’s defenders and displaced civilians. The Turkish military, along with Islamists using the FSA label, is launching a war of aggression against an area within Syrian state borders. The Turkish raid aimed at occupying Afrin and carrying out ethnic cleansing is a clear breach of international law and must be so named and condemned. In addition, the NATO partner Turkey and its Islamist allies commit these crimes with German Leopard II tanks and weapons. These weapons of German production target not only the civilian population, but also those women and men who defeated the IS in their stronghold Raqqa, in Kobanê and other places and thus defended our security in Germany. Afrin is one of the three democratically self-governing territories that comprise the Democratic Federation of Northern Syria. Since 2012, the project of Democratic Confederalism has been established here despite war and embargo. This strives for equal self-government and democratic self-determination of ethnic groups, religions and genders. Under the leadership of women, an initiative is taking place that can point the way for the entire region and provide a solution for decades-old conflicts. This project, which gives hope for a peaceful and democratic Syria and can have a positive effect on the entire region, deserves our support. The Turkish attacks, however, undermine the chance of a speedy resolution in the Syrian conflict, destabilizing the entire region, leading to more suffering and flight. Above all, the various ethnic and religious groups in Afrin are seriously confronted with the risk of genocide. In Turkey itself, all people who speak out against this war and for peace are labeled as terrorists and traitors. So far, more than 600 people have been arrested in Turkey because they spoke publicly or on social media against the aggressive war on Afrin. That’s why it’s so important that we speak out against Erdogan’s war. In order to lend weight to our demands, we urge you to take to the streets together for democracy and peace in Afrin and to protest against the Turkish aggression. All democratic institutions and associations, anti-war, ecology and women’s movements, trade unions and individuals are invited to support and disseminate our call. Hartmut Ring, GEW-Hamburg, Ausschuss für Friedenserziehung, PädagogInnen für den Frieden-Gruppe Hamburg. Niels Detloff, 2. Vorsitzender Friedensscheune e.V. Heidi Merk, SPD, Landesjustizministerin a.D.
Susanne Hennig-Wellsow, Landesvorsitzende der Partei DIE LINKE. Thüringen. Sabine Berninger, flüchtlingspolitische Sprecherin der Fraktion DIE LINKE. im Thüringer Landtag und Mitglied im Landesvorstand DIE LINKE. Thüringen. Gerhard Trabert, Prof. Dr. med. Dipl. Soz.-päd. Norman Paech, Jurist und emeritierter deutscher Professor für Politikwissenschaft und für Öffentliches Recht an der Universität Hamburg. Martin Singe, Komitee für Grundrechte und Demokratie e.V. Herbert Schmalstieg, Oberbürgermeister der LH Hannover a. D.
Heinz D. Kappei, Berliner Initiative ‚ Legt den Leo an die Kette‘ ! Henning v. Stoltzenberg für die Rote Hilfe e.V. Frauen für Frieden Hessen e.V. Feministische Kampagne Gemeinsam Kämpfen! Für Selbstbestimmung und Demokratische Autonomie! #Berlin 3. März 2018: Gemeinsam gegen die türkischen Angriffe auf #Afrin! – Enough is Enough!